Preheat oven to 175°C/350°F. Dice tomatoes, bell pepper, onion, and cucumber. If you like, remove the seeds from chili, then mince. Peel and cube melon. Add all chopped ingredients olive oil, cumin, lime juice, and mint to the blender and finely purée. Chill the gazpacho until ready to serve. Cut the bread into cubes for the coconut croutons. Pour coconut oil over the cubes until bread is evenly soaked in oil. Place the croutons on a baking tray and bake at 175°C/350°F for approx. 20 min. until the croutons are crisp and slightly browned. Meanwhile, slice avocado and roughly chop cilantro and mint for serving. 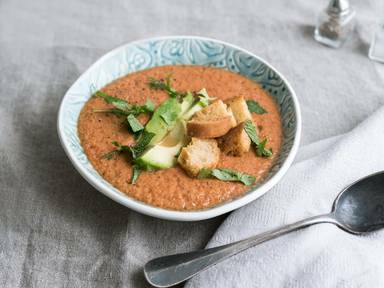 Fill the gazpacho into small bowls and garnish with avocado, herbs, and croutons. Season with salt and pepper to taste. Enjoy!